May when as members of WMMGA, we were doing soil testing at HGC. We were seated indoors next to the displays of summer bulbs. I thought the dahlias looked inviting. Especially since our new home in the Pioneer Valley has sunlit garden space. (Ask me about gardening in the shade some other time). Judy Gatland said she would give me some dahlia tubers, but I bought a few that day from HGC. A few weeks later, Judy delivers 5 grocery bags filled with big, healthy tubers! There were more than I had room for, so 2 bags went immediately to Laurie Conley. The ending of this long, winded tale is that I am now totally besotted with dahlias! Especially now at the end of summer, when even the black-eyed susans are looking tired, these plants are providing big bursts of color and vigor in my gardens. Dahlias come in many heights, from 12 inch tall plants to almost 7 feet, different flower shapes (decorative, cactus, daisy, water lily, pompom or ball, peony style, double orchid, carnation, and even petite types); and then the colors—almost limitless in range. Whatever you fancy, you will be able to find a dahlia to suit that desire. But now, the real task of saving our tubers so we can repeat this great success next year. 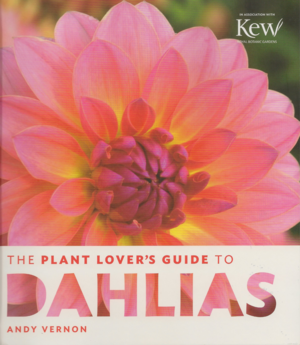 So I purchased The PLANT LOVER’S GUIDE TO DAHLIAS by Andy Vernon, published by Timber Press. The photos of the blossoms alone was enough for me purchase this book (photos by the author, Emma Case, Ball Colegrave, Jason Ingram, Matthew Kidd, and Mark Twyning). But there are also photos of every step in the care and propagation of these lovely plants, including diseases, pests, and other problems; all the disorders are shown here in photographic detail. And he includes all of his recommendations for prevention of problems (including comfrey tea, coffee grounds, milk sprays), and solutions when problems do occur. How to lift the tubers and prepare them for the winter is the section I am studying now. Wintering in the ground or a greenhouse probably won’t work here in western Massachusetts, at least not for a few more years of climate change, but interesting concept none the less. Included in this book are lists of dahlias for every need in your garden: borders, cut flowers, for pollinators, dark leaf varieties, late season bloomers, even dahlias that do not require staking! He includes a ‘Planting Pals’ section of biennials and perennials to plant with your dahlias. In the back of book is a list of suppliers in the UK, Canada, and at last, the US; a list of gardens in which to find dahlia inspiration; and more books on the topic. This love affair with dahlias could go on forever!! The author, Andy Vernon, lives in Birmingham, England. He is a writer, photographer and television producer-director. His love of dahlias is based in his formative years in his grandfather’s garden. He studied horticulture at Nottingham University and trained with the Royal Horticultural Society of Wisley and the Royal Botanic Gardens at Kew. We can find him at www.planetdahlia.co.uk .